So what is this? It’s a custom flex 4 layout that displays elements as in cylinder. The idea for it I got a long time ago when I saw Safari’s Top Sites. Back then I managed to achieve this look and feel with flex using Papervision3D. But I didn’t like the way I made it at all. So year later I have decided to try again. This time with the native 3D support of Flash Player 10 and the new layouting in Flex 4 it was quite intuitive and the most proper solution. 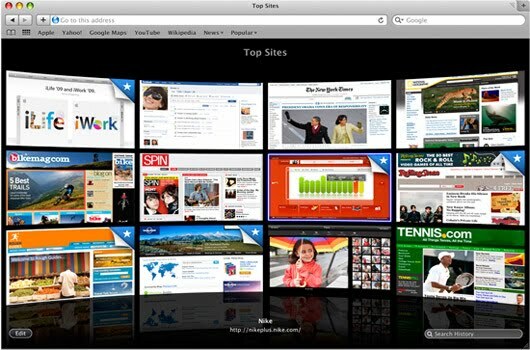 You can see the Flex Top Sites application here and the source code here. In short words when providing this when we rotate the element the point of the rotation will be the center of the screen (container). The other things are just plain geometry calculations, like finding the radius, chord, arc of a circle. Really important thing is to imagine both 3D cylinder, 2D circle from top and 2D rectangle from front. And basically that’s all. You can download the custom layout from here. Nice post. In the first matrix example is this just a picture or you are layouting several images?? @Deras I am aware of this problem. Actually you should be able to click on the other images but only with Flash Player 10.1 that is beta 3. It fixes the bug causing this. yeah i saw the source code and indeed i should be able to click. Strange, atleast i hope the new flash player will fix it. I am a total noob on this, I got the source zip file, how do I create the swf object which display all the sites I wanted? Could you please tell me in details? Thank you for providing me the link, I will start digging~ I know its always more meaningful to learn by myself than get the answer from others. Thanks again. Hi, Tony, do I need to have a Adobe Flex or Flash Builder 4.5 to be able to run your project? All I have now its the Adobe CS5 Design Premium which has Adobe Professional Flash, I don't know if I can use that run your project. Hey! It will be best if you get Flash Builder 4 or 4.5 to run the project. Hi, Tony, your application is completely awesome, the only difference I see b/w yours and Safari is that each of your image is 100% flat, but Safari each image is curved. So if that can be improved, then it will be look more smooth. But still amazing after all. This application is cool!! But is there a way to kill the screen-size border? Thanks! It's always nice to read such comments! Hi, Tony, thank you for the reply, the application takes the full screen, and there is a light grey border line of the application. I am going to use this app for my website link page, but with a title on top you will see the border line. And I am also trying to figure out on how to set the app not full screen. I definitely see the param but it won't affect anything. Thanks Nan for noticing that! Tony, thank you for your reply, actually all I want to get rid of its only the very outer border which is hardly noticed when the application is full screen. But I still wanna keep the border and space for each image, is there a way to do that?